Welcome to a new series where we will hear from Nina Palattella about her experience as a Christian in her senior year of High School. Nina will write a blog post about once a month over the course of the school year. Nina reading during a service at summer camp this year. Hello there, and welcome to my first blog post! My name is Nina, and I am a freshly minted senior at Northwest Pennsylvania Collegiate Academy in Erie. I have an older brother, two dogs, and my hobbies include writing fiction; singing, both in a vocal jazz ensemble at my school and solo, and playing the electric guitar. In addition, I am a Christian; my family and I have belonged to the Episcopal Cathedral of St. Paul, also in Erie, since I was about four years old. I cannot vouch for this personally because I was so young, my parents have said that everyone in the congregation was so welcoming and pleased that they were there, and that made a lasting impression on them and influenced their decision to begin regularly attending the church. Since the beginning, there have been so many ways to get involved within the church and the Episcopal community at large, and I have been fortunate enough to participate in a few of them. I was formally involved in the Cathedral of St. Paul’s Children’s Choir for more than a decade, and I still sing with the regular choir occasionally on Sunday mornings. 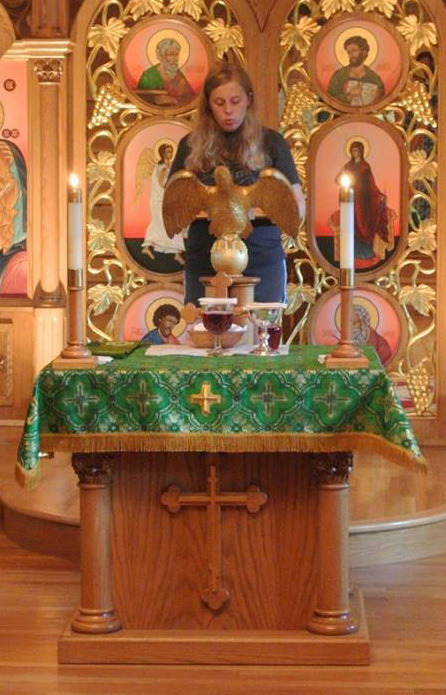 I participate in services as an usher, reader, and I am a licensed Eucharistic minister; my father has served on the church’s board, both as senior and junior warden, for many years, and there have been many Sundays where I spent the entire morning and even some of the afternoon hanging out at church. I have volunteered at community dinners, helped the dedicated food pantry pack bags for people in need in our community, and decorated lamb cakes for the Easter Vigil service. I’ve gone to summer camps, taken part in mission trips to assist other congregations and shared side-splitting moments of hilarity and fellowship with other Christian kids and adult volunteers as part of the Episcopal community for youth known as The Vine. This past January, my mother, father, brother and I, along with eight other members of our congregation, took a trip to India to visit a church that we had helped build, which was a life-changing experience that I hope to discuss in future blog posts. When I was originally approached with the idea of writing this blog, the proposed topic was what it feels like to be a Christian in high school. As I’m sure you’ve gathered thus far, being part of the Episcopal Church has had a *huge* impact on my life, and I think I can say that with comfortably little exaggeration. As I’ve gotten older, it hasn’t always been easy to stay involved in the church, particularly because of my school, which is well known for its demanding and challenging curriculum. There are Sundays when I skip going to church because I have too much homework, or because I’m too tired from everything that I’ve had to do that week; when I do want to or have to go to church, I often have to plan my day around how I’m going to make up for those lost hours of work later in the day. I know many people, including some of my friends, who are skeptical of the faith they once had, some who seem to think that they currently don’t have the time to fit it into their lives, and some who have abandoned it altogether. Because I attend a public high school, religion isn’t a part of the daily lessons, and more often than not I can easily go days without hearing religion mentioned or talking about it in a meaningful context. I don’t hide my faith; I wear a cross necklace that was given to me by my parents the night of my confirmation a few years ago, and if anyone were to ask me about religion I would have no problem telling them that I am a Christian, and I like to think that I would make the other person feel secure in their own beliefs (or lack thereof) while still letting them know that they would be welcome to visit my church anytime. However, I don’t think I have a knack for promoting it or talking about it with relative strangers unless I am prompted by something else. One of my friends from middle school (who has since moved to a different town in Pennsylvania) possessed that skill, and I would marvel how easily she could make friends with someone and talk to them in a completely natural manner about how influential Christianity is in her life. The best strategy that I’ve been able to come up with so far is to not hide my identity and let the people who are interested know how Christianity has benefitted me if and when the subject comes up. I hope you have enjoyed this blog post, and if you have any questions or comments feel free to post them in the comment section below. Thanks and have a great day! This entry was posted in Nina, Youth and tagged Cathedral, Choir, Christian, High School, Nina, youth. Bookmark the permalink. Love seeing you grow and mature..your Church Family and old friends are surely enjoying this! !